Depending on the model, wheels can be a stealthy black or bright chrome. Some options combine black with a polished surface for an extra step up in style. Whichever type you choose, it can accommodate a standard 33-inch all-terrain tire for your off-road adventures. If you're traveling over the toughest terrain, you might want to consider high-clearance fenders. These are available in black or colors that match the body of the Jeep. Otherwise, you might choose standard fenders in either black or matching colors. 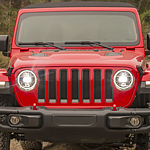 At Eastchester Chrysler Jeep Dodge Ram, you can test drive a Wrangler to see the wheels and fenders in action. Choose your style and find your adventure!